Before long, Kate, Michael, and Emma are on a journey through time to dangerous and secret corners of the world...a journey of allies and enemies, of magic and mayhem. And—if an ancient prophesy is correct—what they do can change history, and it is up to them to set things right. This recap was written and submitted by our sidekick, Rachel! Siblings Kate, Michael and Emma are transferred to a new orphanage in Cambridge Falls where they discover a book that can transport them through time. 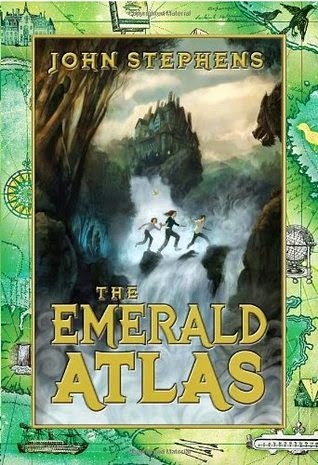 Michael gets stuck in the past on their first travel and from there they travel back and forth through time trying to fix various mistakes and defeat an evil witch named the Countess, who is forcing the villagers of Cambridge Falls to look for a magical treasure long lost – the Emerald Atlas that the siblings posses. Siblings Kate, Emma and Michael are living in the Edgar Allan Poe Home for the Hopeless and Incorrigible Orphans, owned by the nasty Miss Crumley. We find out that this is their twelfth orphanage in ten years. They are sure their parents will come back for them, not believing they are dead. Their last name is only the letter “P”. A lady comes to adopt them but Michael and Emma make fun of her hat and she leaves horrified. Two weeks later, Miss Crumley sends them off to an orphanage up north called Cambridge Falls. The siblings are put on a train and when they arrive at the station no-one can them anything about Cambridge Fall. Randomly, a thick fog rolls into the station, a boat appears, they get on it and the boat-master sails them across the lake to an island. Here they get onto a horse-drawn carriage and the driver, named Abraham, tells them they are the only ones at this orphanage. Kate falls asleep during the trip and dreams of a house. They arrive at the orphanage and Kate realises that the orphanage is actually the house she dreamt about – spooky! In the house, Abraham gives them a picture of the house from fifteen years ago. Abraham tells them what their island used to be like, making weird mention to a group of missing children. He won’t talk further about it. The children go exploring around the house and find an old room with creepy stuff like a blanked-page book. Michael slips Abraham’s picture into the blank book and Emma, Kate and him suddenly find themselves at the bottom of Cambridge Falls. They realise they have been transported into the photo. They see a young Abraham. A creature attacks them. The children run into a clearing where a bunch of thirty or forty children are standing, guarded by nine other creatures. A boy named Stephen McClattery tells them about these creatures – called Screechers – and tells that a mysterious “she” keeps all these children in her house, despite them not being orphans. The children’s mothers are nearby watching and crying. A man and an incredibly beautiful girl arrive on a motorbike. Steven calls the lady “the Countess” and says she is the woman he was talking about. She tells the crowd that she isn’t happy that “their men” have not found “what she is looking for” even after two years and that his is her warning, for every week that they do not find “it”, she will kill a child. A man appears in the crowd and kills three Screechers. The Screechers start screaming. Emma, Michael and Kate are paralysed but manage to shove a picture of the present-day house (one Michael took earlier) into the blank book and Emma and Kate appear in the house. The girls get to meet Dr Pym, the orphanage’s owner, and talk to him. They pretend Michael is sick but do not know where he really is. The girls attempt to find Abraham but cannot. Kate gets out the blank-paged book before she goes to bed to “read” and gets visions when she runs her fingers over the pages. Black marks appear on her fingers and she faints. Emma wakes her. Abraham admits that Dr. Pym is a wizard and teaches the girls about the history of magic. He gives them photos of the Countess and hints that the thing she was asking them men to look for was a magical book. They find a picture of Michael with a “help me” sign and travel back in time. The photo was a trap. A short fight ensues but Emma and Kate are captured by the Screechers. They are taken to the Countess who gives them the typical brag-about-my-evilness speech. She explains that she is looking for the three Book of Beginnings – books that the ancient magicians used to record their discoveries. Michael is revealed to have set them up, in the hope the Countess would find their parents in return. Michael, Emma and Kate are thrown in prison with Stephen, Annie and the other stolen children. They manage to escape with Young Abraham through a secret passageway. Wolves are sent after the children but they avoid capture. The man, later revealed to be called Gabriel, from their first time travel experience saves them and takes them to his cabin. He tells them his story, and talks about a monster that was kept caged in a boat with him. Gabriel goes to fetch his villager’s wisewoman but Screechers approach. They escape through a secret passageway in Gabriel’s cabin but are shortly ambushed. The children run ahead but get separated. Emma goes back to help Gabriel, who is fighting the Screechers off, and Kate runs ahead, chasing a vision. Michael follows her. Emma saves Gabriel from the Screechers led by Cavendish. She is shot with an arrow. Gabriel treats her. Kate and Michael are captured by dwarves. Michael wins them over with his knowledge but they are still thrown in jail for trespassing. In their cell is Dr. Pym, who explains to them the connection between the Countess and Hamish, the dwarves’ king. Kate, Michael and Dr. Pym are called to a meeting with the dwarfish king and court. They are threaten until they agree to open the vault containing the Book of Beginnings. Dr. Pym admits to be a living key to the vault, and says the children are also human keys. Emma is healed by a wisewoman. Gabriel has fallen ill – he has been poisoned and is dying. Michael, Kate and Hamish head off to the Dead City. Emma and her healer, named Granny Peet, convince the villagers they need to fight the Countess. Fergus, a dwarf guide, leads Kate, Hamish, Michael and a group of dwarves to a cavern under the Dead City. They have to swim through a water-filled tunnel to get to the next section. A dwarf is drowned by an unknown monster while swimming. Another dwarf named Wallace saves Kate. They go through a passage and Kate unlocks a door that leads to a small room. The book sits on a pedestal. Kate picks it up and is transported to Dr. Pym’s study. A past version that isn’t aware of recent events. Kate sees her mother and is suddenly transported back to the cavern – without the book. Kate, Michael and the dwarves swim back through the passage but are ambushed by Cavendish and the Screechers. They’re captured. Cavendish interrogates Kate. Emma, Gabriel and some villagers break in and attack Cavendish’s office, where he is holding Kate. A battle ensues. Kate frees Michael. More battling. Kate and Michael free other prisoners. The siblings are reunited. Captain Robbie and his dwarf army show up. Dr. Pym appears and uses magic to cause an earthquake. Cavendish is captured. Emma, Michael, Kate and Dr. Pym catch up. Kate faints and has a vision. Dr. Pym reveals information about the children’s parents. Their last name turns out to be Whibbley. Kate makes secret plans to save the children from the Countess. She break Cavendish out of prison and forces him to take her to Cambridge Falls. Cavendish magics her to the boat where the Countess is. Dr Pym mist-walks Emma, Michael and himself to the lake’s shore. The Countess gets Kate to travel back in time to retrieve the book. Emma and Gabriel go under the dam and find that the gas mine there is about to explode. The creature the Countess was keeping on the boat escape attacks Gabriel. Michael and Dr Pym fight their way onto the Countess’s boat. Michael rescues the children. Kate is back in time. Dr Pym give her the Atlas. Her mother doesn’t recognise her. She returns and gives the book to the Countess who immediately betrays her. Gabriel is fighting a winged creature by the dam. He gets injured. Michael rescues the children from the boat and rows to safety. The Countess collapses. She turns into a green-haired monster-man – possessed by the Dire Magician, it is revealed – and threatens Kate. It collapses again and turns back into the Countess. The dam breaks. Kate, Dr Pym’s body and other children are on the boat. Emma and Young Abraham watch from the lake shore – obviously horrified. Michael jumps off the catwalk circling the dam into the water. He lands in the boat. Up on the shore, Young Abraham takes his last picture, to cement that event happening in all versions of the past, present and future. As the boat begins to fall off the waterfall, Kate shoves Abraham’s photo into the book. They are transported into the woods and the boat does not hit the water. Gabriel remains missing, presumed dead, during all of this. The siblings then place the photo of Kate (in Dr Pym’s orphanage in present day time) in the book and transport “home”. An old, wizened Countess ambushes Kate. Kate manages to harness her magical powers and transports the Countess and herself to Rhakotis. The Countess tells Kate that her parents are being held captive, that’s why they never return for them. Kate ignores her and returns to present day. Dr Pym hold a Christmas party and all the children they saved those fifteen year ago attend, all grown up. Gabriel makes an appearance and so does King Robbie and Wallace. Screechers – the children’s nickname for the ghoul-like creatures with yellow-slitted eyes – they are actually men who sold their souls for wealth and powers hundreds of years ago. The proper name for them is morum cadi, meaning deathless warriors. They feel no pain or remorse, and are tireless servants. Their screams have the power to cause confusion and mild paralysis. Ruled by the Countess who uses them as guards. Books of Beginnings – a set of books that hold the secret recordings of ancient magicians and their discoveries. Wisewoman – a woman that does magic. Atlas or the Atlas of Time– one of the Books of Beginnings. Contains maps of all pasts, presents and futures. The Dead City or Calmartia – the ancient dwarf capital hidden within the mountain. Salmac-tar – sightless, razor-clawed creatures found in the caves and tunnels within the mountain.